So called “smart labels,” those with Radio Frequency Tracking Identification (RFID), are pointing the way toward smart infrastructure—with the global market projected to reach $24.5 billion by 2020, according to The Statistic Portal, a leading provider of market and consumer data. Regardless of what they’re selling—food, clothing or something else—retailers are investing in tracking inventory. “As a world leader in intelligent labels, we’re accelerating the adoption of digitally-enabled products across the retail industry,” said Francisco Melo, vice president and general manager of Global RFID of Avery Dennison, who moderated the panel. The company’s Freshmarx Intelligent Food Industry Solutions is growing its suite of products—including hardware, software and applications. Melo fielded questions about traceability and tracking with RFID as a tool to control costs in the supply chain and order food more efficiently. “We believe in a future where every item will have a unique digital identity and digital life, enabling businesses to improve visibility and efficiency across the supply chain, to ultimately enhance the consumer experience and improve retail margins,” said Melo. Also top of mind was the first-year anniversary of the U.S. Food and Drug Administration’s mandate to disclose calorie counts and nutrition information on both menu boards and grab-and-go items. Some operators hadn’t yet transitioned from hand-labeling items. In partnership with the NRF and the International Food and Beverage Technology Association, Avery Dennison showcased its Freshmarx Ingredient and Nutrition Labeling system, which ensures compliance, allowing operators to print labels on demand with correct nutrition and calorie counts. Smart labels lead to smart infrastructure. Ensuring compliance and controlling food costs is a great place to start. 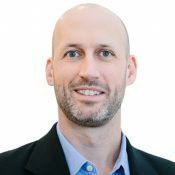 Ryan Yost is general manager, Printer Solutions for Avery Dennison. In his role, he is responsible for worldwide leadership of and strategy for the Printer Solutions Division, focused on building partnerships and solutions within the Food, Apparel and Fulfillment industries.